Description: Defend the ancient mythical city of Atlantis from the Gorgon attack! Atlantis is an interesting shooter that plays slightly like Missile Command but with several important differences. Like the original Missile Command arcade game you have three gun towers to defend against attacks. Waves of Gorgon attackers have to descend four times before they come within range of attacking the city, so you have these opportunities to blast them out of the sky with a well placed shot. If the invaders make it to the level closest to the city they will destroy one of your seven installations. You can regain destroyed installations only after a wave of enemies is wiped out. The gun towers on the left and right sides of the screen fire at a diagonal angle and the main gun in the center fires straight up. Fortunately you have an unlimited supply of ammunition, and the left and right guns cannot be destroyed. Enemies will keep descending in waves until the city is completely wiped out and as they speed up it becomes a great test of your dexterity. 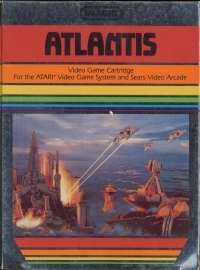 Atlantis features some nice graphics, with well-animated explosions and an easy to learn control scheme. It also is one of the first games to feature a sort of sequel, Cosmic Ark, which plays much differently from Atlantis, but is indicated in the Atlantis manual as continuing on the storyline of those who escaped Atlantis' fate. Fun fact: The game also exists as an "Activision" release completely under the name of IMAGIC. The box is identical except the silver is black. The cartridge is no IMAGIC style cartridge but an Activision Cartridge with a blue label in style of the Activision text labels (but with an IMAGIC logo). There is no Activision printed anywhere except a small label on the back of the box "Distributed by MEDIAGENIC". This is the rarest "Atlantis" release. 01-07-2018 schtzngrmm Description Defend the ancient mythical city of Atlantis from the Gorgon attack! Atlantis is an interesting shooter that plays slightly like Missile Command but with several important differences. Like the original Missile Command arcade game you have three gun towers to defend against attacks. Waves of Gorgon attackers have to descend four times before they come within range of attacking the city, so you have these opportunities to blast them out of the sky with a well placed shot. If the invaders make it to the level closest to the city they will destroy one of your seven installations. You can regain destroyed installations only after a wave of enemies is wiped out. The gun towers on the left and right sides of the screen fire at a diagonal angle and the main gun in the center fires straight up. Fortunately you have an unlimited supply of ammunition, and the left and right guns cannot be destroyed. Enemies will keep descending in waves until the city is completely wiped out and as they speed up it becomes a great test of your dexterity. Atlantis features some nice graphics, with well-animated explosions and an easy to learn control scheme. It also is one of the first games to feature a sort of sequel, Cosmic Ark, which plays much differently from Atlantis, but is indicated in the Atlantis manual as continuing on the storyline of those who escaped Atlantis' fate. Fun fact: The game also exists as an "Activision" release completely under the name of IMAGIC. The box is identical except the silver is black. The cartridge is no IMAGIC style cartridge but an Activision Cartridge with a blue label in style of the Activision text labels (but with an IMAGIC logo). There is no Activision printed anywhere except a small label on the back of the box "Distributed by MEDIAGENIC". This is the rarest "Atlantis" release. 10-14-2012 exonerator Description Defend the ancient mythical city of Atlantis from the Gorgon attack! Atlantis is an interesting shooter that plays slightly like Missile Command but with several important differences. Like the original Missile Command arcade game you have three gun towers to defend against attacks. Waves of Gorgon attackers have to descend four times before they come within range of attacking the city, so you have these opportunities to blast them out of the sky with a well placed shot. If the invaders make it to the level closest to the city they will destroy one of your seven installations. You can regain destroyed installations only after a wave of enemies is wiped out. The gun towers on the left and right sides of the screen fire at a diagonal angle and the main gun in the center fires straight up. Fortunately you have an unlimited supply of ammunition, and the left and right guns cannot be destroyed. Enemies will keep descending in waves until the city is completely wiped out and as they speed up it becomes a great test of your dexterity. 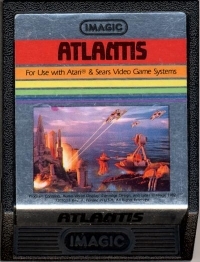 Atlantis features some nice graphics, with well-animated explosions and an easy to learn control scheme. 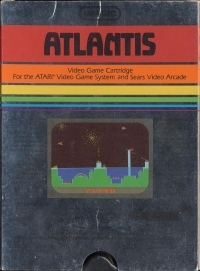 It also is one of the first games to feature a sort of sequel, Cosmic Ark, which plays much differently from Atlantis, but is indicated in the Atlantis manual as continuing on the storyline of those who escaped Atlantis' fate. This is a list of VGCollect users who have Atlantis (Picture Label - Day Scene) in their Collection. This is a list of VGCollect users who have Atlantis (Picture Label - Day Scene) in their Sell List. This is a list of VGCollect users who have Atlantis (Picture Label - Day Scene) in their Wish List.